A man has been arrested in Sydney, Australia, after reportedly setting himself and his car alight and ramming the gate of a police station car park. The suspect, who is in his 60s, suffered serious burns as a result of the incident on Thursday evening, in the western suburb of Merrylands. A top police official said there was no indication of any terrorist connection. The Australian authorities believe the individual involved has a history of mental health problems. No members of the public or police officers were injured during the incident in Memorial Avenue, police said. The suspect was arrested at about 20:00 (10:00 GMT) and a bomb disposal unit deployed, as roads were locked down around the police station. New South Wales state assistant police commissioner Dennis Clifford said officers had spotted the suspect sitting in his car outside the police station. When they approached him, he appeared to ignite an accelerant and drove his vehicle into a roller door leading to the station's underground car park. 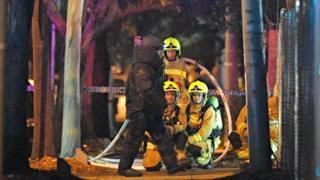 Australian media had reported a number of gas canisters were in the car at the time, although it is not clear how many. "There's nothing to indicate this is in any way related to terrorism," Mr Clifford told reporters. "We just don't know why this person has acted this way." "The police reacted very bravely and it's just a miracle that no one else was seriously injured," he added. Nick Ralston, crime and justice editor at The Sydney Morning Herald, tweeted to say the suspect was "known to police but not believed to have had any known links to a terrorist" organisation. The suspect is being treated in hospital for his injuries.